St. Louise at the Baltimore Cathedral. The celebration included more than 350 Daughters of Charity who traveled from Texas, Quebec, and Africa to join in the historic mass. 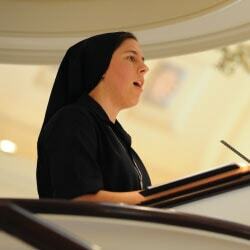 Sister Liz most recently served at Mount St. Mary’s University in Emmitsburg, Maryland. She is a Daughter of Charity. Raised in a devoted Catholic family, Sister Liz credits her parents in part for her vocation. A musician and vocalist, Sister Liz enjoys leading singing and music, working with those in need, and sharing her faith with young people. Soon, Sister will begin working toward her Master’s Degree in Social Work. When asked why she was called to the Community of the Daughters of Charity of St. Vincent de Paul, Sister shares a story about volunteering with the Sisters before she joined the community. She recalls how humbled she was to enter, and prepare food for a needy gentleman. Years later, when visiting the cemetery of the Daughters at Emmitsburg, she saw the tombstone of the gentleman she had served. Without family or friends, he was left alone at his death. The Daughters welcomed him to be buried alongside of them. For Sister Liz, this was truly confirmation that this Community­—who love those in need so much—was the right Community for her.